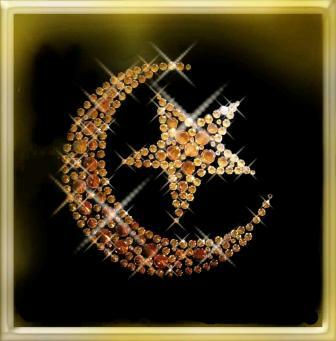 The crescent moon and star is an internationally-recognized symbol of the faith of Islam. The symbol is featured on the flags of several Muslim countries, and is even part of the official emblem for the International Federation of Red Cross and Red Crescent Societies. The Christians have the cross, the Jews have the star of David, and the Muslims have the crescent moon, right? What is the history behind the crescent moon symbol? What does it symbolize or mean? How and when did it become associated with the faith of Islam? Is it a valid symbol for the faith? The crescent moon and star symbol actually pre-dates Islam by several thousand years. Information on the origins of the symbol are difficult to ascertain, but most sources agree that these ancient celestial symbols were in use by the peoples of Central Asia and Siberia in their worship of sun, moon, and sky gods. There are also reports that the crescent moon and star were used to represent the Carthaginian goddess Tanit or the Greek goddess Diana. The city of Byzantium (later known as Constantinople and Istanbul) adopted the crescent moon as its symbol. According to some reports, they chose it in honor of the goddess Diana. Others indicate that it dates back to a battle in which the Romans defeated the Goths on the first day of a lunar month. In any event, the crescent moon was featured on the city's flag even before the birth of Christ.